So I spent the weekend exploring the Mason Tract near Grayling, mi. 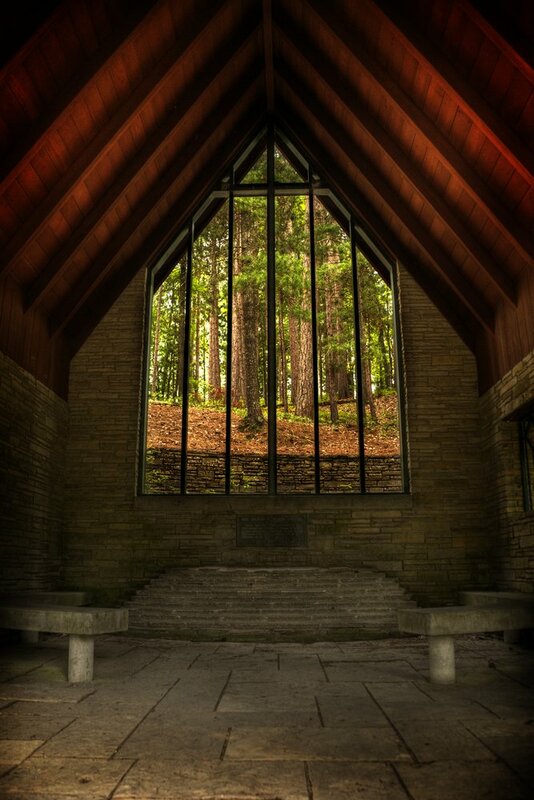 I didn't do a lot of shooting, but did post one photo from the Mason Chapel, a really unique, somewhat remote location, which I wouldn't mind revisiting. Talking tech for a moment - I posted previously about my issues with my 19mm having a sticking aperture. I found a decent 14mm to replace it, which will arrive in a few days. I love the super wide lenses for architecture and creating drama in landscapes. It is probably my favorite lens for those situations. I also managed to find a replacement focusing screen for my 5d mark ii - a split screen, grid format screen, which is sort of a throwback to the old manual focus Canons (or any MF camera, for that matter). Many times I shoot under very low light conditions, such as studio shoots for the Rhythm series, or dark interiors, where autofocus simply fails to work. The standard focusing screens provided with most autofocus cameras are inadequate for precision focusing - unless your eyes are perfect, which mine aren't so much anymore. I had to find this through a third party source, out of Korea (or something), but it has been an item I've been seeking for quite awhile. The first series of HDR images I saw was in a magazine - a series of images of the aftermath of one of the hurricanes in the southern US. The images were striking - boldly different, almost surreal in execution. I wanted to try it. HDR is a process where you merge a range of exposures into a single image, effectively representing a wider exposure range than could be typically processed. The technology is kind of old news at this point, but widely popular. Depending on how you process your images, they can appear quite natural, almost indecernable from standard images. Or they can appear painterly or almost cartoonlike. My first foray into HDR was with the Asylum series, prior to introducing models into that project. In a few cases, I opted for a surrealistic feel to the images - selecting moderate to extreme processing effects for the images. When I first presented these images, the feedback was very positive... People mistook them for paintings, drawings, anything but photography. It's the kind of feedback that makes you feel really good about your work. And then someone asked, "Aren't you the photographer that shot that series [wherever it was]"? It wasn't me. It was another photographer, also shooting HDR. The problem with HDR processing is that the final image is trusted largely to a piece of software, running the image through the same set of modifications and processing that any other photographer would also be using. The end result is that your images are likely to appear stylistically ambiguous. While the results are wild and different, over time these will become dated and generic. As someone that has the opportunity to be exposed to many other artist's photography throughout the course of the week, I tend to find the process almost aversive at this point. I've since strayed from heavy HDR processing in favor of simply using the technology to extract a wider exposure range. My post process techniques follow simple darkroom methods - burning, dodging, tweaking contrast, etc. Beyond that, I may apply some of my hybrid photography techniques, depending on the series. My point, in a round about way, is that it is important as an artist to develop your own style - particularly with photography. While a certain technology, whatever it is (solarization, sepia toning, photoshop watercolor filters, whatever the trend may be), may raise eyebrows now, over time, these processes tend to be swallowed up by the sea of other pieces produced using the exact, or similar, procedural processing techniques. They eventually become generic and dated. Photography is a medium where it can be a challenge to develop a unique artistic style, particularly if you are confining yourself to capturing a single moment, as is, or relying on common post-processing techniques. If you're working in this medium, never stop thinking outside of the box.